Dinosaur Jungle > Dinosaur Facts > Living Dinosaurs? 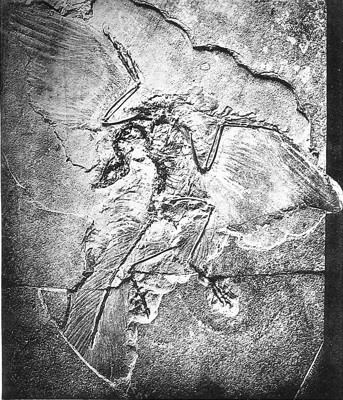 Most scientists now believe that birds evolved from dinosaurs. If this is correct then birds are in fact an evolved type of dinosaur (see dinosaur family tree). Taxonomy is the science of classifying living things. Taxonomists are still discussing whether birds ought to be placed in a single combined group ("class") together with the other dinosaurs, or ought to be classified separately. Part of the confusion arises because of historical usage of the words. When people say or write "dinosaur", they nearly always mean "non-avian dinosaur" (all dinosaurs except birds). The "dinosauria" is sometimes used to refer to a combined class of both the birds and the non-avian dinosaurs. Cryptozoology is the search for rumored or mythical animals, whose actual existence is uncertain (these animals are often known as "cryptids"). In some cases, the animals are claimed to be surviving dinosaurs or other prehistoric animals (such animals are technically known as "relicts"), in others, they are claimed to be as yet undiscovered species. It should be remembered that the both the tuatara and horseshoe crabs are both relicts - the two known species of tuatara are last surviving members of the order Sphenodontia, and horseshoe crabs seems to be most closely related to Sea Scorpions ("Eurypterids"), which disappeared 248 million years ago in the Permian-Triassic extinction event). The Coelacanth (a type of fish) was believed by scientists to have been extinct for at least 65 million years - until one was discovered in a fishing net in South Africa in 1938. The Mountain Gorilla, the Megamouth Shark, and the Hoan Kiem Turtle, were all at one time or another dismissed as being legends (without supporting evidence for their existence) by mainstream science. Today, they are however all accepted as existing. Of course, it's a huge to leap to go from saying that there have been in the past some creatures that were unknown to science, to jumping to the idea that dinosaurs are still living in some part of the Earth. On the whole, most dinosaurs are large (and therefore any living animals would be likely to have been found by now), the time since they were last known to be living is huge, and the evidence for their continued existence is not particularly strong (clear photographs or video are generally lacking) - but it does remain just possible that some dinosaurs could have survived somewhere on Earth. Mokele-Mbembe is perhaps the most famous cryptid claimed as a dinosaur. It is claimed to live in the Congo River basin in central Africa. Local legends describe the animal as about the size of small elephant, grey-brown in color, and preferring to live in deep rivers and swampland. Descriptions of the animal's appearance however vary widely - in some cases it has been described as resembling a small Sauropod dinosaur (similar in shape to an Apatosaurus, but smaller), in other cases as being similar to an iguana or monitor lizard, and in some cases as something more like a familiar large mammal, perhaps an elephant or rhinoceros (some local people also describe the creature as a spirit). There have been numerous expeditions to the area to hunt for the creature, particularly in the last 30 years or so, there is no definitive proof that the creature exists. Emela-ntouka is an animal claimed to be known to the Pygmy tribes of central Africa. It is said to be size of a large elephant, gray-brown in color, with one horn, a rhinocerous-like body, and short stumpy legs. There has been speculation this animal may be a relict Ceroptisian dinosaur, perhaps Centrosaurus or Monoclonius. The Pygmies however do not believe that the animal has a neck frill, which would seem to rule out this theory. In any case, the idea of finding a living Ceratopsian dinosaur in central Africa seems unlikely on its face, because Ceratopsians are not believed to have lived in Africa (Ceratopsians lived in North America, Eastern Asia and possibly South America and Australia - see map below). Ngoubou is a cryptid that supposedly lives in Cameroon, has six horns, and is about the size of an ox. It has been suggested that this animal may be a relict Styracosaurus, but given that Styracosaurus was a Ceratopsian, and Ceratopsians are not believed to have lived in Africa (see map above), this seems rather unlikely. Mbielu-Mbielu-Mbielu is a cryptid that supposedly lives in the Northern part of the Republic of Congo. It supposed to be a herbivore (plant-eater), living a semi-aquatic lifestyle, with "planks growing out of its back", and it has been suggested that it might be a Kentrosaurus. The evidence for this existence of this creature are some accounts from villagers local to the area which were recorded by the cryptozoologist Roy P. Mackal. Nguma-moneme is a cryptid that supposedly lives in the Republic of Congo. It has been described as a lizard with a serrated ridge on its back, and is supposed to be atleast 33 feet (10 meters) long. Sightings of the creature were made in 1961 and 1971, and there are also a number of earlier accounts which could possibly be the same animal.